In order to show the dedication of the archery community and gratitude to the Queens of the Outlands for their patronage of the community and the orders of the Sharparrow and the Golden Pheon, a pair of white gloves were created. The gloves are of white pig suede, lined with gold silk, and embellished on one hand by the badge of the Grant Level Sharparrow complimented on the other with the badge of the AoA level Golden Pheon. The badges are hand beaded. 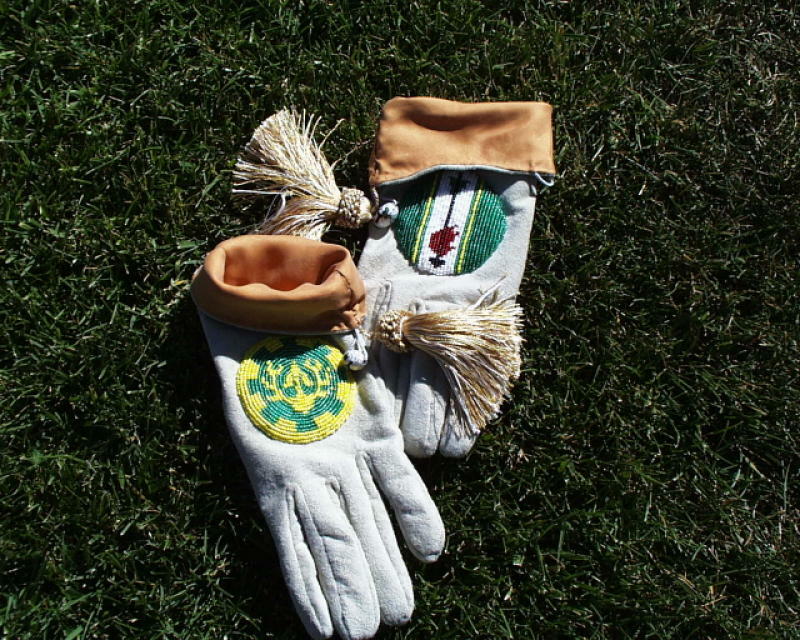 The gloves are hand stitched with white silk and embellished with gold and white tassels. 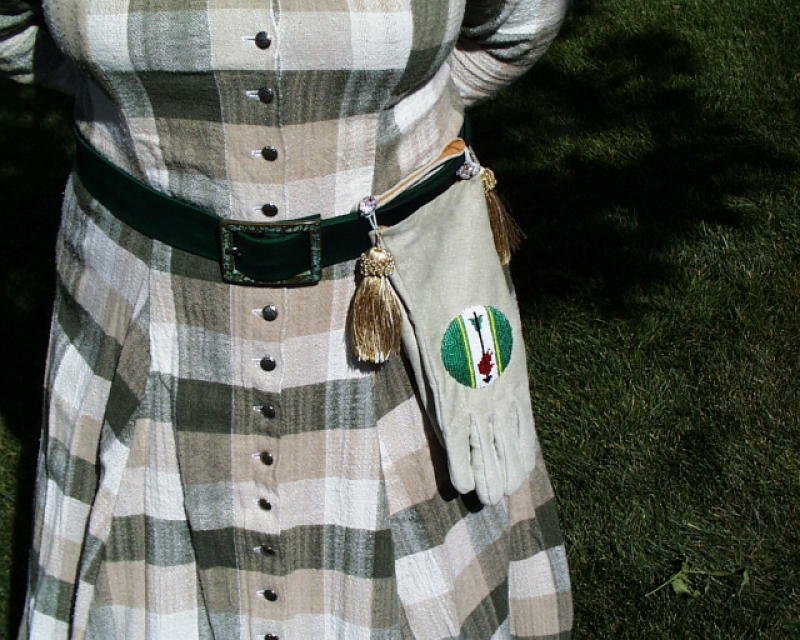 Additionally, they incorporate a button and loop on opposite sides of each glove so they may be buttoned palms together. This places the tassels on opposite sides to reduce bulk. The buttons and loops allow the Queens to wear them over a belt while displaying one of the two badges or over the white scarf when it is worn on the bicep rather than over the shoulder. During the presentation at Crown tournament in March 2002, all the Sharparrows present were introduced in court: THL Ian Lindsey MacRae, Master Duncan MacRae, THL Steitan Bogenschütz, THL Damian d'Antioche, Baron Daniel Larke del Glen, THL Eric Morrison of Thistlekeep, THL Ailinn Shadowfox, Sir Rand the Tracker of Oak Hollow. The names of those not present were also mentioned... Baron Peregrine Elric of Courtenay (premier), Master Thorfinn Greybeard, Sir Tam Grimm (Crown Prince AS XLIX, King AS L), Baron Caomh Beathan Crubach (Ben), THL Ashikaga no Toshihiro (Hiro). These gentles were presented as leaders within the archery community; gentles to whom aspiring archers could look for guidance, teaching, and inspriation. 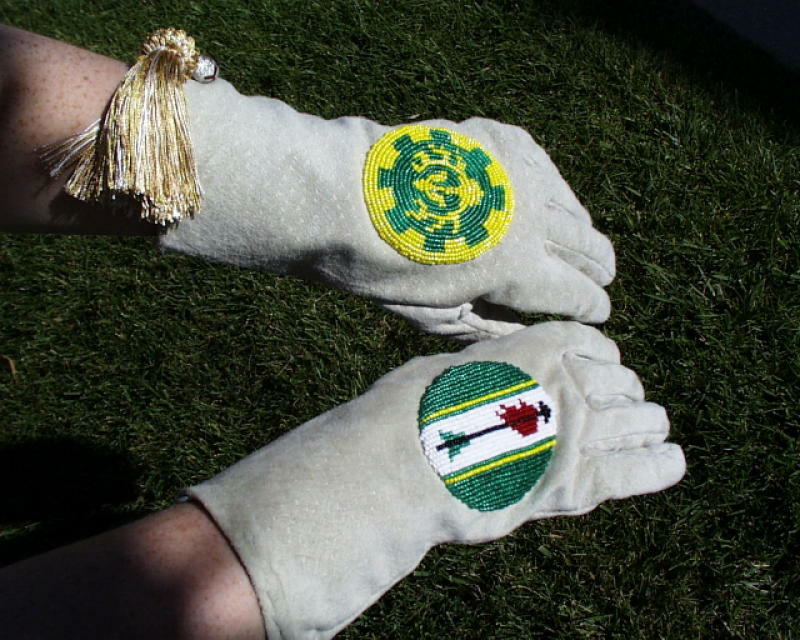 As part of the Queens' Regalia, the gloves are worn by every Queen of the Outlands. Note to Chatelaines serving Their Majesties: If the gloves should become damaged, please contact leofsige@yahoo.com so arrangements may be made for repair. For the Keepers of the Regalia and Chatelaines - This file should be kept with the gloves when not in use and reprinted as needed for your successors.